I’ve had a fire softly burning this week to put my thoughts to this post. I’ve been thinking about kids and young adults making their way in the world. Growing up is no easy task for, I would guess, many people. There are a few lucky souls I believe who can say they had a blessed and happy childhood. But I know far more people who can’t really say that. When I came of age finally able to strike out on my own, while that was heavenly in many ways, personally I was a mess. I think back to my twenties, and of all the decades, my twenties would be my least favorite, hands down. In retrospect, I might have been one of the lucky ones, I found my therapist, Ron, by the time I was 23, so by 26 I was beginning to blossom. But looking back, I was far from healed truly. In a much bigger picture that can only be seen in retrospect, I was beginning my life, and in the early stages of shedding the drama that my parents left me with. Years ago I read a book by Lillian Hellman entitled Pentimento. The title means “a visible trace of an earlier painting beneath a layer or layers of paint on a canvas.” Do you love that as much as I do? The meaning speaks to me of our lives … that girl I was at 26 only exists today as a trace beneath the layers of paint that have been applied over the years. I love my painting these days, but by golly, it’s been a work of art that has taken every minute of every day of every year since then. And if my guess is right, it will continue until my painting is done, also known as until my life is over. The work of creating and defining and improving myself I don’t think will ever end until I leave for higher ground. As I thought about writing this post, I kept thinking about the turkeys that roam around our home. Rick and I always call them a gaggle of turkeys , but I just looked it up, and it seems that a group of turkeys should more accurately be called a rafter of turkeys? Gaggle … rafter … whichever, I couldn’t help thinking about how they travel together and the sounds they make with each other. What a racket they make. We as humans act much like those turkeys. We come into the world so pure and sweet, but from about day one, we are being bombarded by our loved ones and all they come to our story with. We begin learning from a tender age about our parents’ sorrows and their insecurities, and in most cases, about their parents’, and so on. The lessons aren’t taught necessarily in actual words. In probably more cases than not, they are taught by actions. There is no doubt that we continue to learn painful lessons from our parents for the following 20 or so years. And not because our parents don’t love us, quite the opposite. I think in most cases they are trying to save us from their sorrows and disappointments, so they warn us over and over again. If my mom told me once, she told me one hundred times, that if I didn’t slow down, I would have a nervous breakdown just like she did. I knew from my young twenties, that she wasn’t right about that belief, just like I knew she didn’t know how to drive on the freeway. Years later I would congratulate myself on a basic instinct that told me her pain (nor her lack of driving abilities) did not need to be mine. Back to those turkeys, I always say, we just need to look to nature to understand our actions and behaviors as humans. Families tend to act like a gaggle of turkeys, each gobbling louder than the next, working so hard to be heard and understood and above all, WARN our youth about what we have endured in the hopes that they won’t go down the same road. As I said, the gobble gobble starts in the minute we are born from a whole host of loving souls … otherwise known as our family. Is there any wonder by the time we are about twenty heading out into the world that we are a bit confused and conflicted. In most cases, we are just happy to be away from the incessant gobble gobble. I believe it’s then the true journey of the soul begins. It’s where we learn what of the gobble gobble resonates with us, and we begin to slowly but surely leave the excess non relevant gobble gobble behind. It is no easy task. And it doesn’t mean we leave those loved ones behind, we just choose not to carry their sorrows, their beliefs, their dreams with us, as we need room for our own dreams that we will be developing along the way. Here I am at 62 still finding new dreams. What a gift life is. And while it might have been amazing to know in my twenties what I know now, I’d probably be long gone by now, as I do so fervently believe life is about lessons. My painting would not be nearly as beautiful had I finished it years ago. Thinking back through my life up to present day, the journey has and continues to require a few necessary requirements, a dream or goal, perseverance, faith in a higher power as well as myself, and the willingness to work hard to achieve what I need. It still remains sometimes easy to neglect what I need to do for myself, even when I know what it is. I think it might always be a little like that. After all, if life was that easy, this world would be a much different place. It’s not easy. So, it’s up to us to figure out what makes us tick, what feels like a tick, and what tickles us. They are three different things, each important in their own right. I know yoga makes me happy, makes my heart soar truly, and yet over the last month when I have felt so down, I didn’t turn to yoga to help. I’d like to say it’s just not ingrained enough, but I think that’s a cop out. I am, once again, just human. And sometimes I don’t gravitate to what I know I need. And maybe that’s enough for where I have been, getting over being sick and anticipating the end of something I have felt a passion for, my job at Virgin America. In the end, I return to the fact that, we humans are a puzzle. I have faith in something higher than us, waiting for the time when we do choose to help ourselves. That’s where our life changes and also the path where I believe we start to feel the higher powers lifting us along our journey. Without going into too much detail at this point about my father’s youth, suffice it to say he suffered true heartbreak as a child. He developed a love for music as a young boy, and it became his passion. His father, for whatever reasons, rejected my father, and blatantly favored my father’s sister. Thank goodness his mother took an opposite stance and from what I know supported him at every turn. He worked at paper routes as a boy and any odd jobs he could muster up to pay for his music lessons. He made his dreams come true, becoming in time an accomplished musician. He played both violin and sax. Family pictures line my hallway, treasures that I stop often to visit. 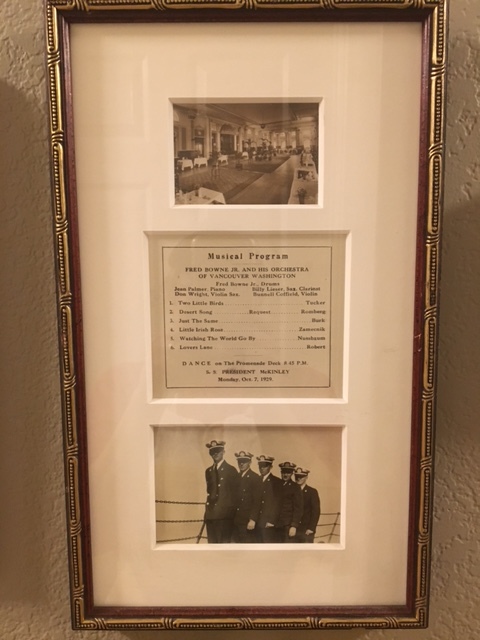 I have a number of pictures of him as a young man in various bands, and another in a group that played on a cruise ship, in the era of Titanic, so nostalgic. I will use one of them as my post picture. His passion came to a tragic halt when in his twenties, traveling in a storm, he crashed his car traveling over black ice, his arm out the window. He spent a number of months in the hospital healing, and in the end they were able to save his hand, but his fingers would never again play music. As a child, this story was lost on me. He was just my dad, with the funny scar on his stomach from the skin they used to graft his wrist, and the stiff and missing fingers. I think in retrospect his heart was broken beyond repair, but he never let me see that. He had his demons for sure when he drank, but when he was sober, he was a light-hearted man for all he had been through. He never passed up a chance at playing a practical joke. As a child, the dog, the bird and I fought for his attention when he walked through the door at the end of his work day. He took his time with each of us. I never knew my dad to be a musician … tragic really. I didn’t see that underbelly that most likely defined my dad. I was left with a man who never complained, but always had his music playing. I loved him more than I could ever put to words, until he broke my heart. And that’s what I mean when I refer to the gaggle of turkeys. They can’t help themselves traveling together making so much goddamn noise … neither can we as humans. We will all hurt each other in time. That’s a given. What’s much more important is what we learn to forgive both in ourselves as well as others. My dad taught me more lessons than I will ever be able to count, but one that stays with me consistently, is this … never take for granted your gifts, whatever they may be. Make the best of them every day, because you just never know when that passion or that gift will become only a memory. Celebrate life … celebrate yourself with every single solitary flaw you possess … they will all come together to make a beautiful painting one day.